All of our antennas are tested under all sorts of conditions, but the final test for all of my antennas is under realistic, on-the-air conditions. I want to know how an antenna will perform against other stations and all sorts of antennas. The best way to do that is to use the new antenna in a contest were the biggest and best stations are on the air. 1. How many countries (entities) can I work in a single weekend. 2 The Sprint - how many countries (entities) can I work in a given number of hours. 3. How many hours will it take to work 100 countries (entities). This means, how long did it take to work DXCC. Of course, this is the time to works the stations. Confirming the contacts is something completely different. Still, it is a good test since you can't confirm a station until you work that station. Operating Event 2011 CQ WWDX SSB contest. Conditions Conditions were poor. I don't recall the sunspot number but I think it was in the low 20's. I didn't record any of the solar conditions, but they were much better during the week prior to the contest. Band conditions were good enough to work most parts of the world from the east coast, but signal strength of DX stations was modest. * Results 100 countries or entities in 18 operating hours during the 48 hour contest. 18 hours was to total operating time spread over several time segments. Three or four hours is about all I can handle at a time. I have to admit that my contest skills are rusty. Running the RADIO WORKS® all these years has taken its toll. Plus, I got older and slower along the way. Still, it's fun to get into a DX contest during the first few hours when things are really competitive and see what one of my antennas can do up against lots of top-gun competition. My operating style is very casual. I hunt-and-pounce mainly and if something interesting is going on, I'll stop and listen. Obviously, it it certainly possible to beat the 18 hours to DXCC by a good margin. Still, DXCC in 18 hours isn't bad. The 18 hours was my actual time on-the-air. I should also mention, though I was using excellent station equipment, I could have done just as well with my old Kenwood TS-930SAT driving my Collins 30L-1 (600 watts output). It may have taken an hour or two longer, but the outcome would have been the same. In fact I may give that a try this winter to show that you can be competitive DX'ing without sending a lot money. It just takes a good antenna. 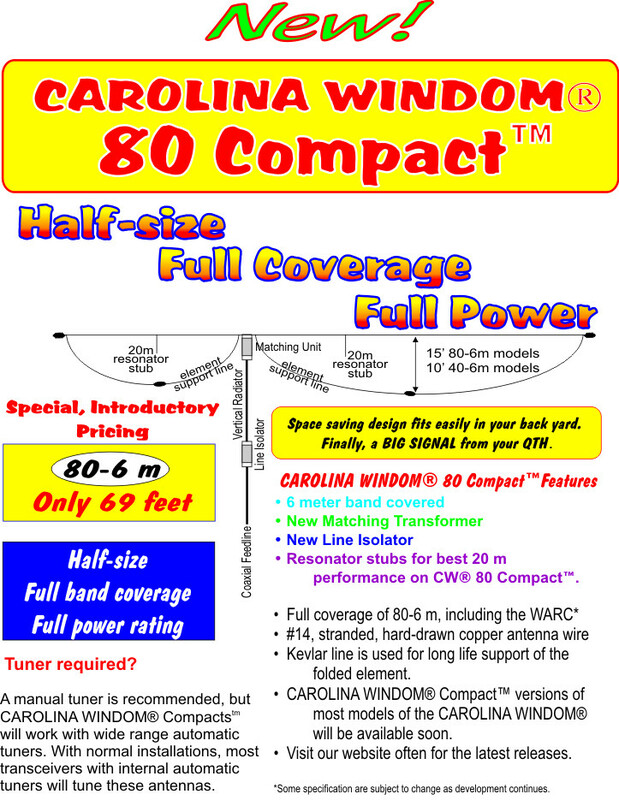 Observation: Anything I could hear or work with the CAROLINA WINDOM® 80, I could work with the CAROLINA WINDOM® 80 Compact with only a couple of exceptions. This was because of the slightly different radiation patterns of the two antennas. Want more information. Click here.